Nest has just unveiled a whole host of new features across its lineup, but curiously absent was any mention of its learning thermostat. But could an update to its central control app, called 'Spaces', be an indication that big changes are coming to the thermostat that started it all? The thermostat, which is one of the most popular smart thermostat on the market, allows you to schedule different heating levels in your house for different levels of the day, and can also be controlled remotely via Nest's app. The thermostat also uses an embedded motion-sensor to intelligently establish whether a user is at home or not and adjust the temperature accordingly. The biggest issue with the thermostat as it stands is that it relies on the thermostat itself being the home's sole temperature and movement sensor. This means that if you have your thermostat in a location which is particularly hot, cold, or you simply don't go as much, then the thermostat is liable to get the temperature of your house wrong, or to assume you're out when you're just chilling (literally) in another room. Also problematic is that the thermostat doesn't allow you to set different temperatures for different rooms, so if you have any rooms that get particularly cold then you either have to live with them being colder or else increase the temperature in the rest of the house to compensate. This ultimately results in energy being wasted since your boiler is working to heat rooms which may be empty or otherwise not in need of more heat. As it currently stands, the 'Spaces' update, which allows you to organise your Nest products by room rather than by function, doesn't fix this problem. But giving users the ability to categorise their Nest products by room rather than by function, suggests that the company may be planning to allow more granular control of the different rooms in your house. After all, at the moment it doesn't make much sense to divide your Nest products based on rooms. Most people will have just a single thermostat in the house, and at most one smoke detector per floor. 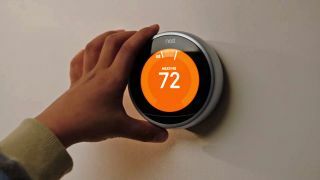 But if this app update is a sign of things to come then we might be set to see Nest give users the ability to control temperature on a room by room basis, allowing them to save energy by not heating rooms that people aren't in, or turn up the valve on a radiator in a room which is one of the colder in the house. We've already seen automated radiator valves from the likes of Loxone, which allow for temperatures to be controlled on a room by room basis, so the technology to do this definitely exists. What would then be needed in addition to controlling individual radiators is a means of establishing which rooms are currently occupied as well as their temperatures, like Ecobee's solution currently offers. Nest's representatives refused to comment when I asked them about the plans directly, so at the moment this speculation is just that. But if Nest does go down the multi-room heating route it might be set to save users a lot more than the 10-12% that Nest currently advertises.